The 2017 Lasallian Leaders' Gathering which took place in Sydney (February 26-28) was well received by those in attendance. Considered as a significant annual event for the Lasallian Mission Council, Lasallians without Limits - working for a hopeful future - provided a dynamic platform for discussion and reflection. With 63 delegates from across all of four sectors of the District Australia, New Zealand, Pakistan and Papua New Guinea, LLG presented a valuable opportunity to address current challenges and opportunities, welcome new school Principals and celebrate the highlights and the many successes of each Sector as one Lasallian community. The opening address by Brother Visitor, David Hawke, commenced the significant gathering on day one, setting the tone for the next three days.
" I emphasise the importance of District identity, for while we have a multiplicity of works and Lasallian communities across the District, each with its own identity, we do form a District community of Lasallians. Between the last Lasallian Leaders Gathering and this one, the solidarity expressed between Lasallian institutions within the District has continued to shape our District identity," said Brother David Hawke. 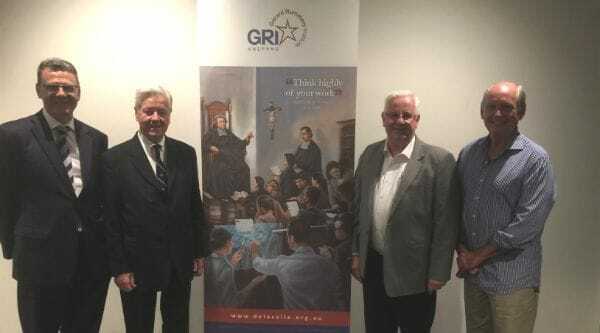 In acknowledgement, Br David and Br Ambrose Payne both provided updates regarding the Royal Commission and Child Safety in the Lasallian Context. For more information please read message from Brother David Hawke. Executive Director, Merv McCormack, reflected on the positive growth of the Lasallian Mission Services' team, and their dedication, passion and commitment shown to providing a District wide service. "Our strategy has been deliberate and closely aligned to our vision, which is to have direct responsibility for coordinating the delivery of mission in all parts of the District, including in associated schools, and for providing Formation opportunities and Youth Ministry Services," Merv McCormack said. A reoccurring theme at LLG was the Viability and Vitality of the Lasallian Mission, evident across all of the four Sectors. Brothers and lay partners were all unified in their sense of strength and pride in belonging to the Lasallian community although diverse across its entire reach. With a changing landscape and inevitable realities, Brother Chris Gorringe reminded the audience of the importance of mission the Lasallian community provides as a collective. "With four different Sectors, the spotlight needs to be on the mission itself, with the focus on the positives and on the mission of education," said Brother Chris Gorringe. Stay tuned to read more about the diverse Lasallian community and further updates from LLG Sector updates from Australia, NZ, Pakistan, PNG, and projects from yourtown, the work of the Lasallian Foundation, Brother Gerard Rummery's contribution of over 65 years of service to the worldwide Lasallian Family and the 2019 Tercentenary Celebrations.